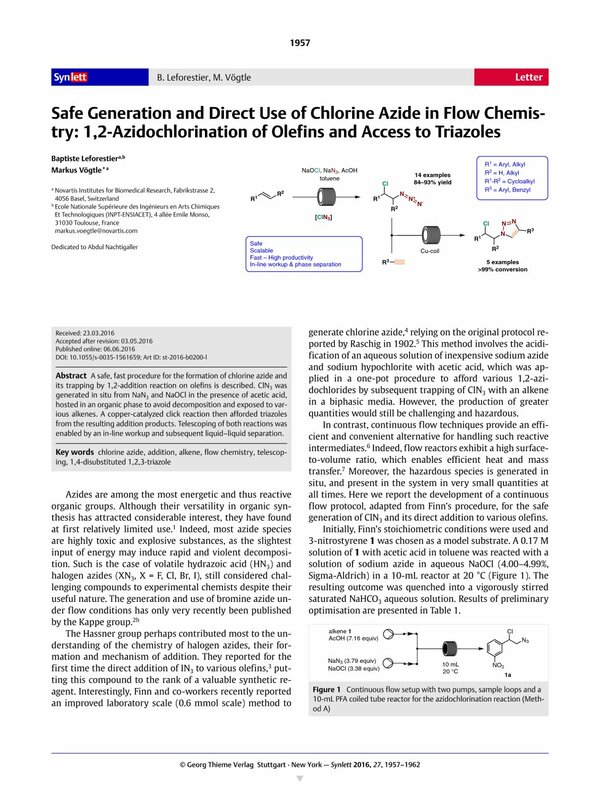 A safe, fast procedure for the formation of chlorine azide and its trapping by 1,2-addition reaction on olefins is described. ClN3 was generated in situ from NaN3 and NaOCl in the presence of acetic acid, hosted in an organic phase to avoid decomposition and exposed to various alkenes. A copper-catalyzed click reaction then afforded triazoles from the resulting addition products. Telescoping of both reactions was enabled by an in-line workup and subsequent liquid–liquid separation. Supporting information for this article is available online at http://dx.doi.org/10.1055/s-0035-1561659. 14 General Procedure ‘Method A’: A solution of organic substrate and acetic acid in toluene (2 mL, 0.18 M and 1.27 M, respectively) and a solution of sodium azide and sodium hypochlorite in H2O (2 mL, 0.67 M and 0.60 M respectively) were combined at a T-piece and reacted at 20 °C in a 10-mL PFA coiled tube reactor (1mm diameter). The combined stream was collected in a vigorously stirred vial containing NaHCO3 (4 mL, sat aq) and was left to stir for 5–10 min. The biphasic mixture was extracted with CH2Cl2 (3 × 5 mL), the combined organics were dried over Na2SO4, concentrated under reduced pressure. When necessary, the crude product was purified by flash chromatography (silica gel, heptane–EtOAc). 15 1-(2-Azido-1-chloroethyl)-3-nitrobenzene (1a): Isolated as a yellow oil (73 mg, 0.32 mmol, 92%); Rf (20% EtOAc in hexane) 0.17. 1H NMR (400 MHz, CDCl3): δ = 8.31 (t, J = 2.0 Hz, 1 H, ArH), 8.24 (ddd, J = 8.3, 2.3, 1.0 Hz, 1 H, ArH), 7.77 (dt, J = 7.8, 1.3 Hz, 1 H, ArH), 7.60 (t, J = 8.0 Hz, 1 H, ArH), 5.05 (t, J = 6.7 Hz, 1 H, CHCl), 3.84 (dd, J = 12.9, 6.8 Hz, 1 H, CHaHbN3), 3.75 (dd, J = 12.9, 6.8 Hz, 1 H, CHaHbN3). 13C NMR (101 MHz, CDCl3): δ = 148.7, 140.4, 133.6, 130.2, 124.2, 122.7, 59.5, 57.8. 17 General Procedure: A 0.1 M solution of 1,2-azido chloride x in toluene (0.25 mL/min) and a 0.1 M solution of alkyne y in MeCN (0.25 mL/min) were combined at a T-piece and reacted at 100 °C in a 5-mL copper-coil reactor (Vapourtec, 1-mm diameter) for a residence time of 10 min (a 8 bar back pressure regulator was used). The combined stream was collected and directly concentrated under reduced pressure. Purification, if necessary, was performed either by flash chromatography or by redissolving the crude mixture in MeCN and provoking precipitation by the slow addition of H2O. 18 1-[2-Chloro-2-(4-chlorophenyl)propyl]-4-(4-methoxyphenyl)-1H-1,2,3-triazole (8a′): Isolated as a white solid (69 mg, 0.191 mmol, 95 %). 1H NMR (400 MHz, CDCl3): δ = 7.70 (d, J = 8.2 Hz, 2 H, ArH), 7.57 (s, 1 H, CHtriazole), 7.48 (d, J = 8.6 Hz, 2 H, ArH), 7.37 (d, J = 8.5 Hz, 2 H, ArH), 6.95 (d, J = 7.9 Hz, 2 H, ArH), 4.88 (s, 2 H, CH2), 3.83 (s, 3 H, OMe), 1.96 (s, 3 H, Me). 13C NMR (101 MHz, CDCl3): δ = 159.9, 140.0, 134.9, 129.0, 128.0, 127.2, 123.1, 120.2, 114.4, 70.0, 62.6, 55.5, 28.7. MS (ESI): m/z = 362.1 [M + H]+.